Congratulations on your Baby’s 1st Christmas. The joy of a child at the holidays is wonderful. At the same time it can be nerve racking. A Baby’s 1st Christmas and first 6 months means you have just recovered from putting away all the baby shower gifts and adjusting to a baby in the house. Or for the 6-12 month baby, you are gearing up for the 1st birthday. Baby’s get lots of attention and love. Where Santa comes once a year to fill it with childhood delights. 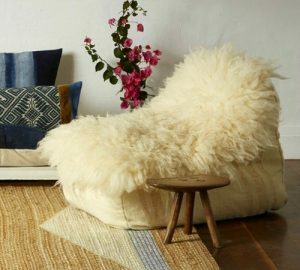 Selecting the stocking style is up to you, think about not just who they are at this moment but how this stocking will come out for years to come. A friend mother selected green velvet and antique lace and turned it into a velvet boot for her. 30+ years later with her own child, she continued the tradition with blue velvet, lined with gold silk, and made a boot for her son’s stocking. Tradition. If this is a 2nd or 3rd baby in the family, might I suggest you have the older children help choose the baby’s stocking. A wonderful tradition to start. I know of a family who gave an engraved silver bell to their daughter every christmas. When she got married, her mother handed the bells to her for the new family christmas tree. Then she had a baby girl who is receiving her 1st first silver bell, this Christmas. 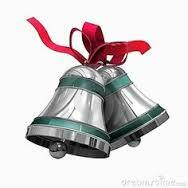 Not everyone can afford silver bells but the idea behind it is pretty cool. Start with one ornament that represents the year leading up to christmas. With each child, they get a different yearly ornament. Then when the child grows up and gets married, the have a collection of memories to start their own tree with. Now if this is your 2nd or 3rd child and you have not done the ornament tradition, have no fear. Start it now. Let your children pick out their ornaments and help select baby’s 1st ornament. The great thing about traditions, they can start at any time. Oh the fun, the joy and the ability to go way way overboard. How do I know this? Because most of Santa’s helpers do this. 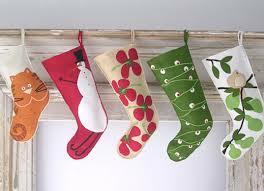 The first stocking can stay simple with only a few things. Patagonia’s Synchilla Fleece Booties $29 Little toes that get cold are never a good thing. 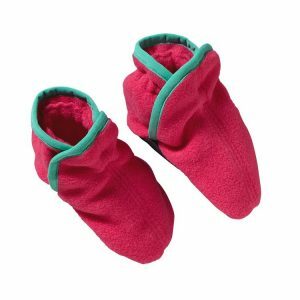 These booties are super soft and warm, have 2-layer soles with a nonskid bottom for easy on/off. Perfect for stroller rides and sitting in swings. Musical instruments are great to help with the senses– sound, touch, see, and lets be honest, taste as well. 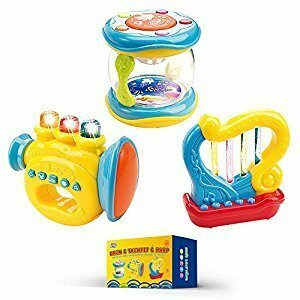 This Set of 3 Trumpet, Drum, Harp Music Toys can be found on Amazon for $17. There are many options available. Check out your local toy store if you want to see the endless options. Of course, this means your baby could be the next Amadeus– so if a little noise is not your thing, pass on this. Otherwise, it is fun to see a baby’s eyes light up when they learn press button = make noise. If your baby is not already teething, they will be soon. Green Sprouts Teething Ring $8 is a colorful key shaped teether made with PVC Free and BPA free materials. Fitting perfectly into the stocking. The last stocking stuffer is a little stuffed animal. Pick something that represents the year for you, or maybe a movie classic like Star Wars. 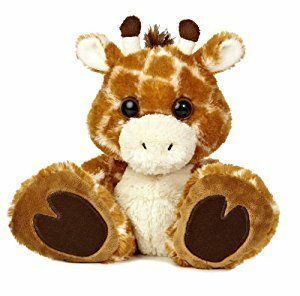 Personally, I love Giraffe’s and would want to share that with any baby. The Aurora World Taddle Toes Safari Giraffe $10 features make me giggle. 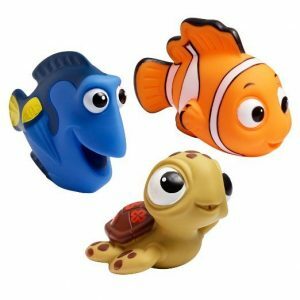 Bath toys are great stocking stuffers.The First Years Disney Baby Bath Squirt Toys, Finding Nemo at $7 are fun to look at and fun to play at. Then as your baby gets older you can introduce them to the wonderful movies of Finding Nemo and Finding Dora. Reading to your baby is wonderful. Downside babies are also learning to touch and taste. You need durable books. 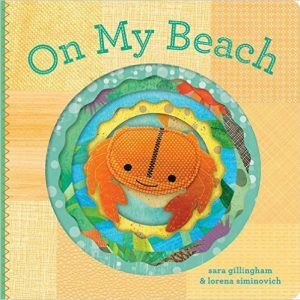 Board books are great gifts. They will last a long time…depending on how much or how little your baby wants to taste it. Bundled up babies look so squishy, warm and cuddly. 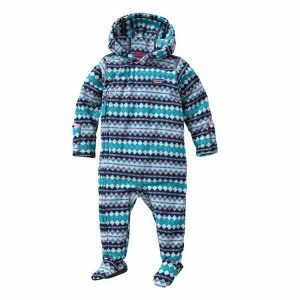 The Patagonia Infant Fleece Bunting $65 is a great layering one-piece with hood and feet. Perfect for strolling around town and walks in the park. We all know a baby does not need or want anything…YET. Don’t worry by next year they will be able to start voicing their opinion. Good gifts for babies sometimes means great gifts for parents to use for baby. A great stroller will bring happiness and joy to both baby and mother. Now you might be saying I have a stroller already, I got it at my baby shower. Many parents have more than one for different purposes. 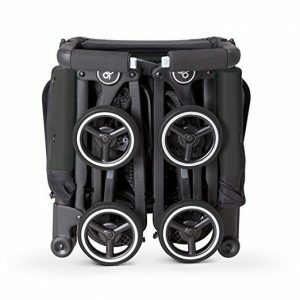 If you plan on doing any travel with baby, the gb Pockit stroller, $200, is a great choice. It has a two-step folding system, self-standing when folded, it is exactly 12″ x 7″ x 20″, and weighs less than 11 lbs. I bet it could fit into a Ju-Ju-Be bag for overhead compartment or under the seat on airplanes. Want to stay in shape, check out Baby Jogger 2016 Summit X3 $340-430 jogging Stroller. An all terrain stroller means it can handle anything from dirt roads to city sidewalks. With air filled tires and a lockable front wheel you can go from walking to running with no problem. Do you need to hop in and out of taxis, trains or buses? The Baby Jogger City Tour $160-200 is a great choice. At on 14lbs, near-flat recline, one-hand quick fold, with a convenient backpack style carry bag, it means you can head out for coffee with the girls, hop on the train and go exploring. When you want to settle into the couch and unwrap your presents, maybe cuddle next to your spouse, the perfect present for baby is the Graco Duet Oasis with Soothe Surround Baby Swing $205 The only swing “technology to sync sound an vibration to life time-tested soothing methods” who wouldn’t want to swing in it. The swing doubles as a rocker, offers 10 soothing environments to customize for baby’s preference: Car Ride, Heart Beat, Lullaby, Stroller Ride, Playful, Twinkle, Waves, Raindrops, Wind and Bells. Place baby in and enjoy some down time on christmas and many days after. A first Christmas for a one month old means lots of sleep and milk. The first Christmas for an eleven month old means active baby. The best something to do gift really is just the wrapping paper, tissue paper and boxes from other peoples presents. Just saying but I know like any parent, you want to actually give them something. I find stacking things and banging things are a baby’s favorite thing to do. 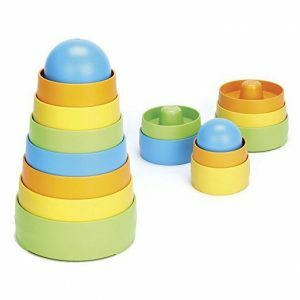 Green Toys My First Stacker $13 with 8 colorful stackable nesting pieces are great. Green Toys are made in the USA from recycled milk jugs. They are super durable and can handle anything baby does to them. Green Sprouts Stacking Cups $7 stack, drip and float. With different sizes and draining holes, bath time is a blast. These last a long time and are entertaining even for the 3 year old. Building things is a large part of a babies life. 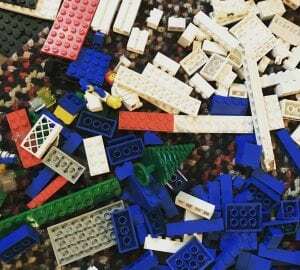 Different sizes, different textures, different colors — they are all part of the learning process. Schllying ABC Big Blocks 48 piece set $30 brings hours of fun. Now they say for 19+ months but I found the textures, letters, and colors have been loved by the 8 month old. They are made out of wood. These will easily handle many years of fun. If you are going to have blocks you need something to carry them around in. Radio Flyer’s Classic Walker, $80, is just the thing. Perfect to help the little one learn to put away toys, learn to walk and to use for the next few years. Baby’s first Christmas is more about the parents building memories. Keep it simple. Start traditions. Find gifts that will grow with your baby in the first couple years. I promise you they might not remember their first Christmas but if the present you gave them now is cherished for years, they will remember the gift.